List includes: Brooklyn & Throgs Neck (N.Y.), Yankee Doodle (Conn.), Memorial (Va.-DC) and Greensboro (N.C.) Bridges. 1,900 structurally deficient bridges are on the Interstate Highway System. Average age of a structurally deficient bridge is 67 years old, compared to 39 years for non-deficient bridges. 41% of U.S. bridges (250,406) are over 40 years old and have not had major reconstruction work. 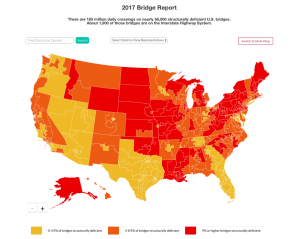 (WASHINGTON)—The length of the nation’s structurally deficient bridges if placed end-to-end would stretch 1,276 miles, half the distance from New York to Los Angeles, a new examination of federal government data shows. It’s a problem that hits close to home. An analysis of the U.S. Department of Transportation’s (U.S. DOT) recently-released 2016 National Bridge Inventory data finds cars, trucks and school buses cross the nation’s 55,710 structurally compromised bridges 185 million times daily. About 1,900 are on the Interstate Highway System. State transportation departments have identified 13,000 Interstate bridges that need replacement, widening or major reconstruction. The inventory of structurally deficient bridges has declined 0.5 percent since the 2015 report. At that pace, it would take more than two decades to replace or repair all of them, according to American Road & Transportation Builders Association (ARTBA) Chief Economist Dr. Alison Premo Black, who conducted the analysis. Black says the data shows 28 percent of bridges (173,919) are over 50 years old and have never had any major reconstruction work in that time. To help ensure public safety, bridge decks and support structures are regularly inspected for deterioration and remedial action. They are rated on a scale of zero to nine—with nine meaning the bridge is in “excellent” condition. A bridge is classified as structurally deficient and in need of repair if its overall rating is four or below. 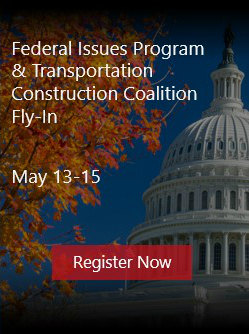 At least 15 percent of the bridges in eight states—Rhode Island (25 percent), Iowa (21 percent), Pennsylvania (20 percent), South Dakota (20 percent), West Virginia (17 percent), Nebraska (15 percent), North Dakota (15 percent) and Oklahoma (15 percent)—fall in the structurally deficient category.